Dupa intalnirea cea mai importanta a sefilor de state si de guverne in cadrul Consiliului Nord Atlantic, Secretarul General NATO Jens Stoltenberg a sustinut o conferinta de presa. In transcriptul pe care vi-l redau in continuare se regasesc intrebarea adresata de mine Secretarului General si raspunsul sau despre Romania. We have agreed to strengthen the Alliance’s deterrence and defence posture in all domains. We are reinforcing our maritime posture and have taken concrete steps to improve our overall maritime situational awareness. We have prepared strategic assessments on the Baltic and Black Seas, the North Atlantic, and the Mediterranean. Through an enhanced exercise programme, we will reinvigorate our collective maritime warfighting skills in key areas, including anti-submarine warfare, amphibious operations, and protection of sea lines of communications. The posture will also ensure support to reinforcement by and from the sea, including the transatlantic dimension with the North Atlantic being a line of communication for strategic reinforcement. In the air domain, we have agreed a Joint Air Power Strategy, which is a key enabler for NATO’s peacetime Air Policing and Ballistic Missile Defence missions. It will strengthen our Integrated Air and Missile Defence, and guide our aerospace capabilities to operate together jointly, more swiftly, and effectively in peacetime, crisis, and conflict. We also face new threats from cruise missiles and the proliferation of related technology as well as from new challenges, such as unmanned aerial vehicles, and will monitor developments that could affect Alliance security. Recognising that space is a highly dynamic and rapidly evolving area, which is essential to a coherent Alliance deterrence and defence posture, we have agreed to develop an overarching NATO Space Policy. The greatest responsibility of the Alliance is to protect and defend our territory and our populations against attack, as set out in Article 5 of the Washington Treaty. No one should doubt NATO’s resolve if the security of any of its members were to be threatened. Faced with a highly diverse, complex, and demanding international security environment, NATO is determined to maintain the full range of capabilities necessary to deter and defend against any threat to the safety and security of our populations, wherever it should arise. Allies’ goal is to continue to bolster deterrence as a core element of our collective defence and to contribute to the indivisible security of the Alliance. Following changes in the security environment, NATO has taken steps to ensure its nuclear deterrent capabilities remain safe, secure, and effective. As long as nuclear weapons exist, NATO will remain a nuclear alliance. The strategic forces of the Alliance, particularly those of the United States, are the supreme guarantee of the security of Allies. The independent strategic nuclear forces of the United Kingdom and France have a deterrent role of their own and contribute significantly to the overall security of the Alliance. These Allies’ separate centres of decision-making contribute to deterrence by complicating the calculations of potential adversaries. NATO’s nuclear deterrence posture also relies on United States’ nuclear weapons forward-deployed in Europe and the capabilities and infrastructure provided by Allies concerned. National contributions of dual-capable aircraft to NATO’s nuclear deterrence mission remain central to this effort. Supporting contributions by Allies concerned to ensure the broadest possible participation in the agreed nuclear burden-sharing arrangements further enhance this mission. Allies concerned will continue to take steps to ensure sustained leadership focus and institutional excellence for the nuclear deterrence mission, coherence between conventional and nuclear components of NATO’s deterrence and defence posture, and effective strategic communications. The fundamental purpose of NATO’s nuclear capability is to preserve peace, prevent coercion, and deter aggression. Given the deteriorating security environment in Europe, a credible and united nuclear Alliance is essential. Nuclear weapons are unique. The circumstances in which NATO might have to use nuclear weapons are extremely remote. NATO reiterates that any employment of nuclear weapons against NATO would fundamentally alter the nature of a conflict. If the fundamental security of any of its members were to be threatened, however, NATO has the capabilities and resolve to impose costs on an adversary that would be unacceptable and far outweigh the benefits that any adversary could hope to achieve. Fifty years since the Treaty on the Non-Proliferation of Nuclear Weapons (NPT) opened for signature, it remains the cornerstone of the global non-proliferation regime and has an essential role in the maintenance of international peace, security and stability. Allies are strongly committed to full implementation of the NPT in all its aspects, including nuclear disarmament, non-proliferation, and the peaceful use of nuclear energy. NATO’s nuclear arrangements have always been fully consistent with the NPT. Consistent with the Statement by the North Atlantic Council of 20 September 2017, which we reaffirm, NATO does not support the Treaty on the Prohibition of Nuclear Weapons that is at odds with the existing non-proliferation and disarmament architecture, risks undermining the NPT, is inconsistent with the Alliance’s nuclear deterrence policy and will not enhance any country’s security. This treaty will not change the legal obligations on our countries with respect to nuclear weapons. The Alliance reaffirms its resolve to seek a safer world for all and to take further practical steps and effective measures to create the conditions for further nuclear disarmament negotiations and the ultimate goal of a world without nuclear weapons in full accordance with all provisions of the NPT, including Article VI, in an ever more effective and verifiable way that promotes international stability, and is based on the principle of undiminished security for all. We reiterate the Alliance’s full support to the goal of complete, verifiable, and irreversible denuclearisation of the Korean Peninsula. We welcome the recent meetings and declarations between the leaders of the Republic of Korea and the Democratic People’s Republic of Korea (DPRK), and between the leaders of the United States and the DPRK, as a contribution towards reaching the final fully verified denuclearisation of the DPRK in a peaceful manner. We strongly condemn the DPRK’s nuclear tests and ballistic missile launches in violation of numerous United Nations Security Council resolutions, and call upon the DPRK to suspend such tests, consistent with its commitment and international obligations. We also condemn the DPRK’s use of the VX nerve agent in an assassination in Malaysia. We call upon the DPRK to fully implement its international obligations; to eliminate its nuclear, chemical, and biological warfare capabilities and ballistic missiles, and abandon all related programmes; to return to the Treaty on Non-Proliferation of Nuclear Weapons (NPT) and its Comprehensive Safeguards Agreement with the International Atomic Energy Agency (IAEA); to comply with the Biological and Toxin Weapons Convention (BWC); and to accede to the Chemical Weapons Convention (CWC). We call on all nations to maintain decisive pressure on the DPRK, including by fully implementing existing UN sanctions. We reiterate our full solidarity with our partners in the region — Australia, Japan, New Zealand, and the Republic of Korea — with whom we have had multiple consultations on this issue. We are concerned by Iran’s intensified missile tests and the range and precision of its ballistic missiles and by Iran’s destabilising activities in the wider Middle East region. We call upon Iran to refrain from all activities which are inconsistent with UNSCR 2231 — including all annexes. We are committed to permanently ensuring that Iran’s nuclear programme remains peaceful, in line with its international obligations and commitments to never seek, develop, or acquire a nuclear weapon. We underscore the importance for Iran to continue to fully cooperate in a timely manner with the IAEA. We condemn all financial support of terrorism, including Iran’s support to a variety of armed non-state actors. We also call upon Iran to play a constructive role by contributing to efforts to counter terrorism and achieve political solutions, reconciliation and peace in the region. Syria has a significant inventory of short range ballistic missiles whose range covers part of NATO’s territory and some of our partners’ territories. Syria has used these missiles extensively against its own population. We remain concerned that Turkey has been hit three times in the last four years by missiles launched from Syria. We continue to monitor and assess the ballistic missile threat from Syria. In light of NATO’s operational experiences and the evolving complex security environment, a comprehensive political, civilian, and military approach is essential in crisis management and cooperative security. Furthermore, it contributes to the effectiveness of our common security and defence, without prejudice to Alliance collective defence commitments. In line with our Comprehensive Approach Action Plan, we will continue to pursue coherence within NATO’s own tools and strands of work, concerted approaches with partner nations and organisations such as the UN, the EU, and the OSCE, as well as further dialogue with non-governmental organisations. Non-EU Allies continue to make significant contributions to the EU’s efforts to strengthen its capacities to address common security challenges. For the strategic partnership between NATO and the EU, non-EU Allies’ fullest involvement in these efforts is essential. We look forward to mutual steps, representing tangible progress, in this area to support a strengthened strategic partnership. NATO guarantees the security of our territory and populations, our freedom, and the values we share – including democracy, individual liberty, human rights and the rule of law. Our Alliance embodies the enduring and unbreakable transatlantic bond between Europe and North America to stand together against threats and challenges from any direction. This includes the bedrock commitment to collective defence set out in Article 5 of the Washington Treaty. NATO will continue to strive for peace, security and stability in the whole of the Euro-Atlantic area, in accordance with the purposes and principles of the UN Charter. We face a prolonged period of instability. Russia is challenging the rules-based international order by destabilising Ukraine including through the illegal and illegitimate annexation of Crimea; it is violating international law, conducting provocative military activities, and attempting to undermine our institutions and sow disunity. At the same time, a multitude of threats emanate from NATO’s Southern periphery. While significant progress has been made in defeating ISIS/Daesh, terrorism, in all its forms and manifestations, continues to threaten Allies and the international community and to undermine stability. Instability contributes to irregular migration, trafficking and other challenges for our countries. Allies stand firmly in unity and solidarity in the fight against terrorism. We will share fairly the responsibilities of defending each other. 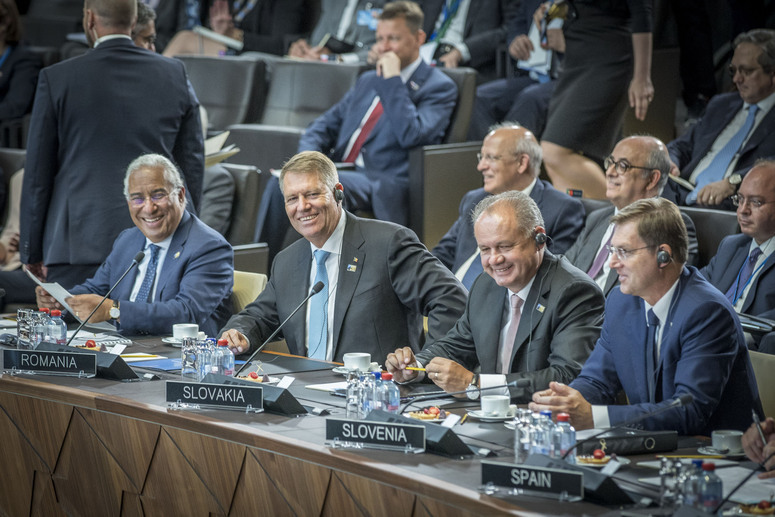 Real progress has been made across NATO since our last Summit in Warsaw, with more funding by all Allies for defence, more investment in capabilities, and more forces in operations. But even if we have turned a corner, we need to do more, and there will be further progress. We are committed to the Defence Investment Pledge agreed in 2014, and we will report annually on national plans to meet this Pledge. Today we are strengthening further our deterrence and the collective defence of all NATO territory and populations, building on our Forward Presence and consistent with the decisions taken in Warsaw. Our deterrence and defence is based on an appropriate mix of nuclear, conventional and missile defence capabilities, which we continue to adapt. We will increase the readiness of our forces and improve our ability to reinforce each other within Europe and across the Atlantic. As part of that, we have agreed an adapted and strengthened NATO Command Structure. We are also further reinforcing the cyber defence capabilities of Allies and of NATO itself. We are strengthening our capacity to prepare against, deter and respond to hybrid threats. Hybrid tactics increasingly target our political institutions, our public opinion and the security of our citizens. Allies are making our societies more resilient against them, and we will respond with resolve when necessary. NATO poses no threat to any country. All these measures are defensive, proportionate and transparent, and within NATO’s legal and political commitments. We remain fully committed to arms control, disarmament and non-proliferation. We remain ready for a meaningful dialogue with Russia to communicate clearly our positions and, as a first priority, to minimize risk from military incidents, including through reciprocal measures of transparency. We continue to aspire to a constructive relationship with Russia, when Russia’s actions make that possible. We are boosting NATO’s contribution to the international fight against terrorism. We have decided, on request of the Iraqi Government and in coordination with the Global Coalition to Defeat ISIS, to establish a training mission in Iraq. We will increase our assistance to the Afghan Security Forces, providing more trainers and extending financial support, as the Government makes an unprecedented political effort to seek a peaceful resolution to the conflict. 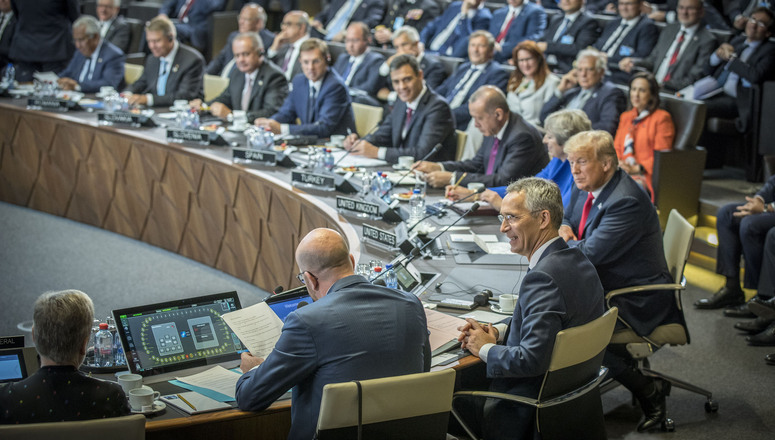 NATO will do more to help Allies, on their request, to tackle terrorism at home; to provide advice and support to partners, including through the new Hub for the South; and will continue to contribute to the Global Coalition. We are strengthening NATO’s contribution to projecting stability, because we know that our security is best assured if it is shared beyond our borders. We have agreed a Package on the South to deepen our political dialogue and practical cooperation with our partners in the region, including Jordan and Tunisia. We provide tailored support to our eastern partners Georgia, the Republic of Moldova and Ukraine, as well as to Bosnia and Herzegovina. We will also boost NATO’s cooperation with Finland and Sweden in the Baltic Sea, as well as with our partners in the Black Sea, Western Balkans and Mediterranean regions, each of which is important to Alliance security. We are maintaining our important operation in Kosovo. And while remaining a transatlantic Alliance, NATO will retain its global perspective. The NATO-EU strategic partnership is essential for the security and prosperity of our nations and of the Euro-Atlantic area. The European and North American Allies contribute significantly to European security and defence. We recognize that a stronger and more capable European defence will lead to a stronger NATO. We therefore welcome the Joint Declaration signed by the NATO Secretary General and the Presidents of the European Council and Commission, which sets out the unprecedented progress being made in NATO-EU cooperation, including on military mobility. We welcome the significant contributions of the members of both organisations to Euro-Atlantic security. We are committed to NATO’s Open Door policy because it strengthens the Alliance and contributes to Euro-Atlantic security, in keeping with the Bucharest Summit. We warmly welcome the agreement between Athens and Skopje; this success will benefit both countries, the region and NATO. We have decided to invite the Government in Skopje to begin accession talks to join the Alliance once the terms of the agreement are met. We continue to modernize the Alliance. To face evolving security challenges, we have taken steps to ensure that NATO can continue to act at the speed required. Our new policies on NATO’s support for Women, Peace and Security, and for the protection of civilians and children in armed conflict, demonstrate our determination to step up NATO’s role in these areas. We pay tribute to all the men and women who serve, and who have served, in NATO operations and missions. Their service and sacrifice has been essential to keep our territories and populations safe.